While Apple's done an impressive job slimming the tablet down and taking off nearly half a pound, it doesn't feel cheap — it's an Apple product, after all. Naturally, iOS 7 looks really great on that Retina display — though you knew that already right? What's really notable here, however, is just how zippy things are, thanks to the inclusion of the A7 chip. You really notice that speed when launching apps like iMovie, which boots up in an an instant. That'll get you around the new free version of iLife pretty swiftly. Long story short: it looks and feels like a larger (but not that much larger) iPad mini, and that's mostly a really good thing. It's really beautiful, with cleaner bezels, a much thinner profile, and sharper, boxier edges. The 9.7-inch device feels much better in one hand than it used to, though it's certainly not as portable as the iPad mini — which now has a screen to match the Air. They feel fast, though not noticeably different from the A7-powered iPhone 5S. Even despite a couple of surprising omissions, like a TouchID fingerprint sensor, this device deserves a new name: it feels completely different than the full-sized iPad once did. A tablet's heft plays a crucial role in how quickly your arms tire holding it. In this update, Apple has managed to reduce its hardware's weight by half, an impressive feat that you're only likely to notice because you hardly notice it at all. In fact, even though we knew the specs, nothing can prepare you for how light and slim the iPad Air actually feels in real life. The weight makes it much easier to hold with one hand, and the pared-down bezel makes the screen absolutely pop. 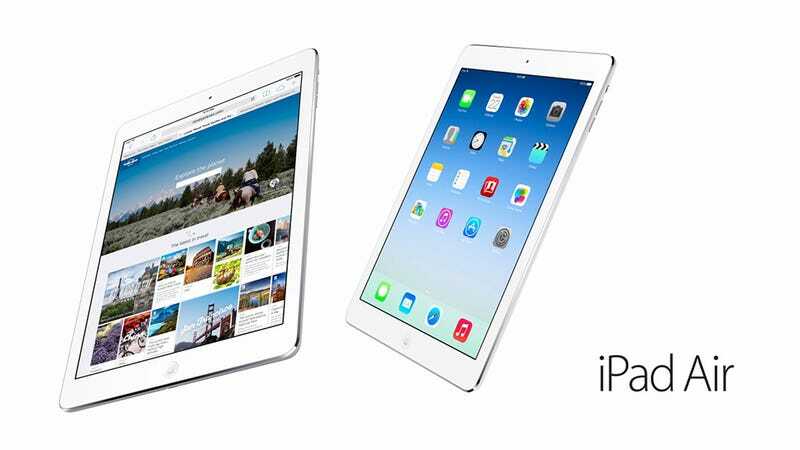 Our first impression: the Ipad Air is like the iPhone 5S of iPads: refined, reduced, and overall improved. It’s the little details that you notice after a while, however. The chamfering to the casing where it meets the toughened glass of the fascia, for instance, or the slimline side controls and lock-switch. Unfortunately there’s no Touch ID embedded into the home button, but we can see ourselves holding the iPad Air for longer periods since the 1-pound weight is almost a third reduction on the old model. Of course the 9.7-inch retina display helps, as does the virtually the same innards as the iPhone 5S launched in September. This is Apple not messing around with processor speeds or specs, but merely chucking all the power it can at the device. A lovely update and one that will be snapped up by many, however with no killer brand new feature to show off to your mates expect the Apple faithful to be left wondering what they are supposed to be demoing the next time someone comes around for tea.